For over twenty years Randall has dedicated himself to photographing the natural wonders of West Virginia. He has long been fascinated and captivated by waterfalls, and is most passionate about locating and photographing the numerous waterfalls that are within the realm of the New River Gorge and Potomac Highlands. Randall is a juried fine arts photographer at Tamarack – The Best of West Virginia, located in Beckley and MountainMade, located in Thomas. His work has appeared in the Juried Art Show: The Best of West Virginia 2010, Dickirson Fine Arts Gallery, Tamarack. His work is also in private and corporate collections and has been used for marketing and corporate recruitment. 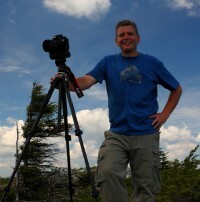 Randall was selected as Photographer in Residence for the Canaan Valley National Wildlife Refuge for the month of June, 2010. He resides in Williamson with his wife Melissa and his trusty hiking companion Rocky, their mixed-breed dog.